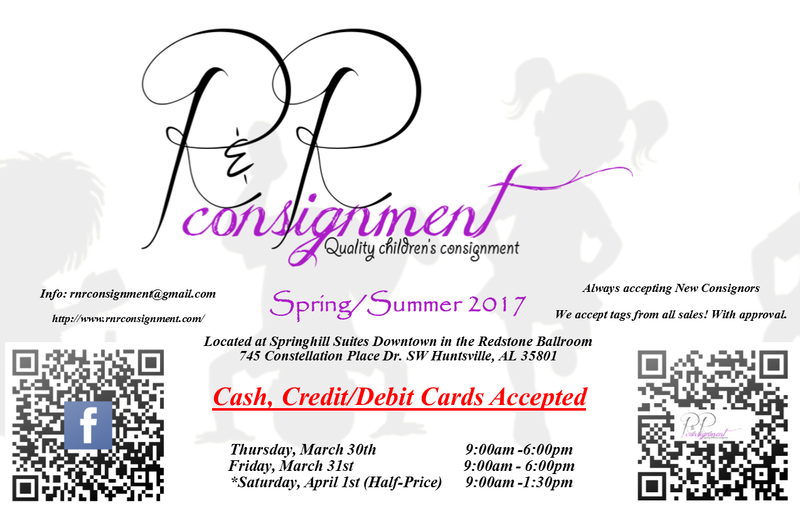 We take tags from all other consignment sales with our prior approval! Sale dates are March 30, 31 and April 1st with consignor shop night Wednesday March 29th, 5:30pm-9:00pm. Our sale will be held at SpringHill Suites (745 Constellation Place Dr. SW, Huntsville. AL 35801). Please let us know ASAP if you are planning to participate, space is limited. Tuesday drop-off is highly recommended (March 28th). We are looking forward to another great sale. ** If you did not consign with us in August 2016 you will need to request a new consignor number. We are always accepting NEW consignors. PLEASE reserve your spot by emailing us your contact information (full name, mailing address and cell number). We are also happy to announce that we will be accepting cash, credit and debit at this sale! PLEASE refer to our blog for a list of items we accept and all important details, along with tagging instructions www.rnrconsignment.com * look under the Consignor Information tab. WE have made changes regarding pick-up, please read ! FOUR HOUR WORKERS SHOP STARTING @ 4:30! Consignor guest shopping passes valid 6:30pm-9:00pm!! PLEASE let us know if you would like to work, limited space is available! WORKERS MUST CONSIGN A MINIMUM OF 25 ITEMS! Saturday "sorting" workers will not be required to pay a consignor fee. This is a 5 hour shift! Follow us on Facebook , Twitter, Google+ or eMail us!